This guide will show you the step by step process of maintaining your Pool Frog Inground Mineral System. It will cover replacing a Pool Frog Mineral Reservoir, using Frog BAM for algae protection and replacing the Pool Frog Bac Pac. 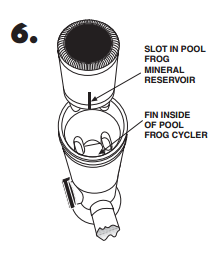 Check the top of the box and back label of product to make sure you have the correct POOL FROG Mineral Reservoir to fit your POOL FROG Cycler. THE POOL FROG MINERAL RESERVOIR MUST BE REPLACED EVERY 6 MONTHS OR AFTER ONE POOL SEASON, WHICHEVER IS SHORTER. Open the box and remove the POOL FROG Mineral Reservoir. IMPORTANT: Remove and read the information card. 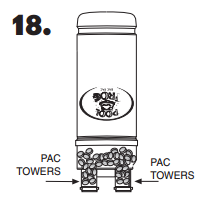 Complete instructions for inserting a POOL FROG Mineral Reservoir, FROG BAM and POOL FROG Bac Pac are included in the POOL FROG Mineral Reservoir box. USE ONLY the factory recommended replacement POOL FROG Mineral Reservoir, FROG BAM and POOL FROG Bac Pac. DO NOT USE any other pac or bulk chemical tablets in the POOL FROG Cycler. Use of any other product could result in damage to pool equipment or surface, unsafe pool conditions, fire or explosion. 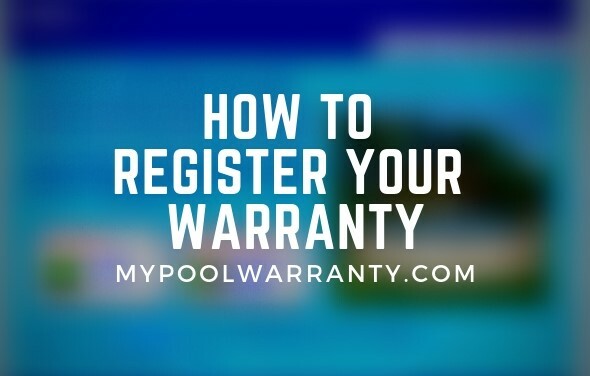 Warranty will be void if the correct POOL FROG Mineral Reservoir, FROG BAM and POOL FROG Bac Pac are not used. Turn off pump. 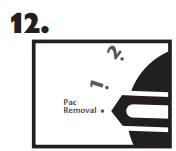 Turn dial to Pac Removal. 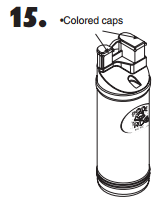 This reduces the flow of water into the unit when the cap is open. 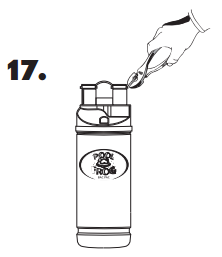 Use the cap tool included with POOL FROG Cycler to loosen cap by hitting the handle with the flat of your hand counter clockwise. If using the POOL FROG Bac Pac, stand back to avoid inhaling chlorine fumes. Find slot on side of POOL FROG Mineral Reservoir and line up with fin inside the POOL FROG Cycler. Lower POOL FROG Mineral Reservoir into POOL FROG Cycler until secure. 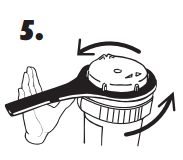 If you are not using FROG BAM, proceed to Step 15. See FROG BAM product labeling for complete directions for use. One FROG BAM for pools up to 15,000 gallons. Two FROG BAM for pools between 15,000 and 30,000 gallons. 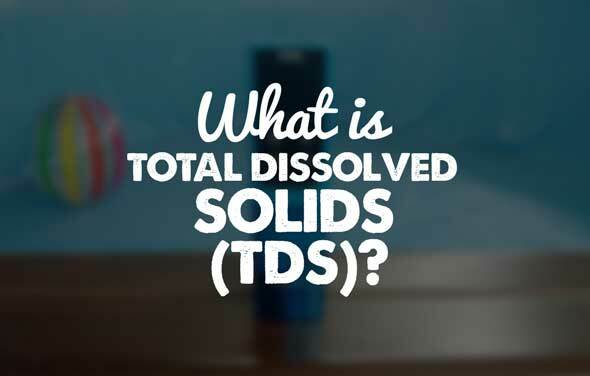 NOTE: Do NOT super chlorinate 48 hours before or after using this product. Avoid using other chemicals until this product has been circulated (filtered) for at least 24 hours. Remove cap from FROG BAM without removing seal. Insert upside down into center of POOL FROG Mineral Reservoir pushing down firmly on key to puncture seal. Replace cap by hand only. Turn control dial on POOL FROG Cycler to Maximum. Turn pump on for 90 minutes allowing FROG BAM to circulate through pool. To remove FROG BAM turn pump off. 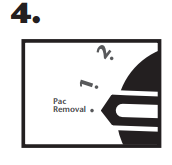 Turn dial to Pac Removal. Remove POOL FROG Cycler cap. Lift FROG BAM up and allow any water in the container to drain through the POOL FROG Cycler before discarding in trash. NOTE: If water shows more than a hint of blue inside POOL FROG Cycler, replace the POOL FROG Cycler cap, turn dial to Maximum and run the pump for one minute. 14a. If pool size requires additional FROG BAM, repeat steps 7-14. 14b. When water is clear in POOL FROG Cycler, proceed to step 15. CAUTION Read Carefully – USE ONLY the factory recommended replacement POOL FROG Bac Pac. (See label.) DO NOT USE any other pac or bulk chemical tablets in the POOL FROG Cycler. 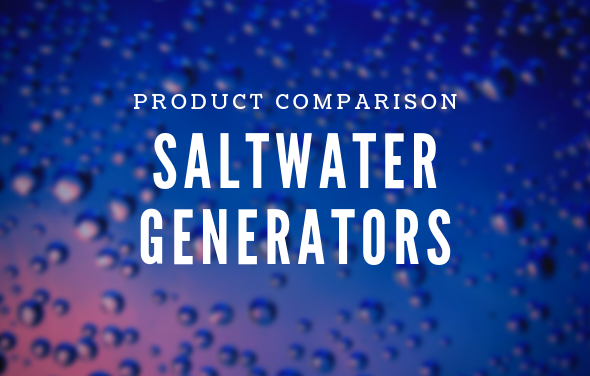 Use of any other product could result in over chlorination, bleached liners, unsafe pool conditions, fire or explosion. Warranty will be void if the correct pac is not used. POOL FROG Bac Pac recommended to assure up to 50% reduction in chlorine use*. POOL FROG Bac Pac sold separately. *Compared to the minimum EPA recommended chlorine level of 1.0 ppm for a stabilized swimming pool. Avoid sparks, open flame or smoking when handling the POOL FROG Bac Pac. To remove POOL FROG Bac Pac colored caps, grab on to the lip of one cap with pliers and pull up until cap releases. Repeat the process for the other cap. 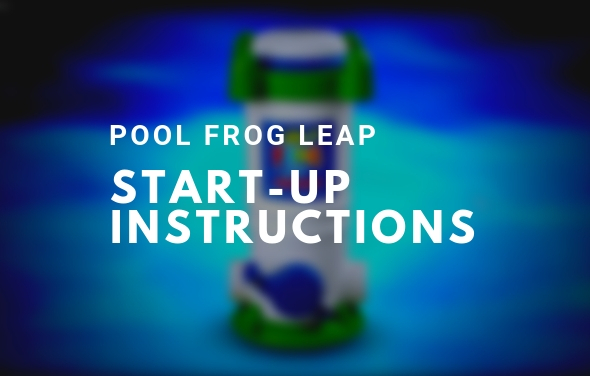 Turn POOL FROG Bac Pac over and shake slightly until chlorine tablets fall into tower areas. Line up the small leg of the POOL FROG Bac Pac with the small opening in the POOL FROG Mineral Reservoir and the large leg with the large opening. Lower POOL FROG Bac Pac into POOL FROG Mineral Reservoir until secure. Replace cap by hand only. DO NOT OVER TIGHTEN. 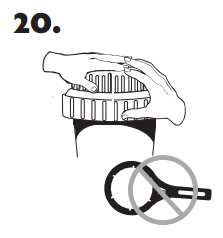 DO NOT USE CAP TOOL TO TIGHTEN CAP. Use for removal only. The POOL FROG Bac Pac is made of HDPE plastic. When the POOL FROG Bac Pac is empty, triple rinse in pool water, drain, and recycle or wrap in newspaper and discard in trash. Mark your calendar for the six month replacement of the POOL FROG Mineral Reservoir, 90-day replacement of FROG BAM and approximate replacement times for the POOL FROG Bac Pac. Once wetted, the time release mineral coating of the POOL FROG Mineral Reservoir is effective up to 6 consecutive months or one pool season, whichever is shorter. After that time, even if you hear the spend media inside, it is no longer effective and must be replaced. 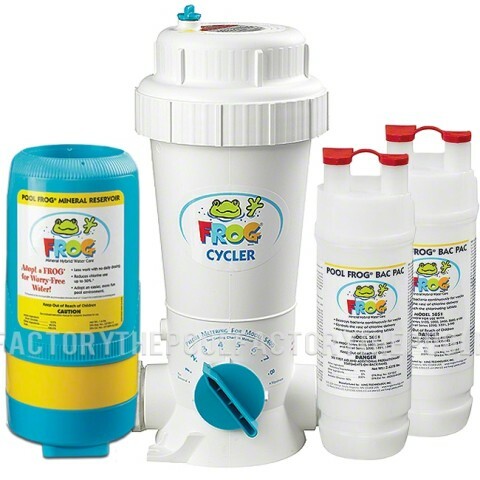 The Pool Frog System Package 5400 Series, uses a Mineral Reservoir and a pre-filled Chlorine Pac, for complete pool care. 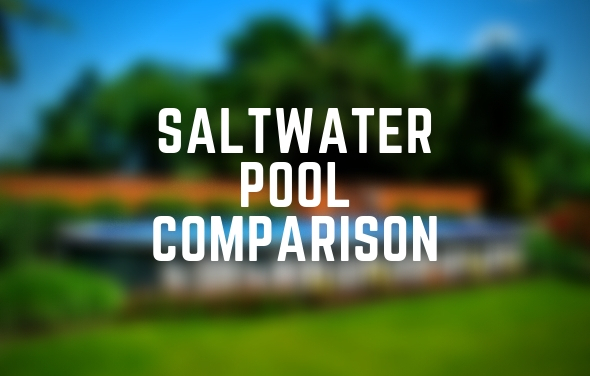 This allows you to have more fun with your pool and spend as little maintenance time as possible.